The finished product of The Temple of Olympian Zeus was short-lived, as it was pillaged during a barbarian invasion just a century after its completion. It was never repaired and its remains were harvested and used for other building projects in the city. Despite the collapse and deterioration of the Temple, 16 original pillars still stand today. The remnants of Greece’s once largest monument is living proof of the architectural skills of the early Romans — or perhaps proof that Zeus continues to reign over the skies of Mount Olympus. The Temple of Zeus, or the Olympieion, was built over several centuries beginning in 550 BC. Its foundations were laid on the site of an ancient outdoor sanctuary dedicated to the God of Thunder, by the order of the young tyrants, Hippias and Hipparchos. The ambitious leaders wanted to surpass the other temples of the day and like many tyrants of the past, they envisioned that their reign would live forever through the large relic. The temple was never finished, as tyranny was overthrown and Athenian democracy was implemented. The Greeks halted the project for several decades, for fear that building a temple on such a large scale would challenge the gods. In 174 BC, the Seleucid king Antiochus IV Epiphanes presented himself as the earthly embodiment of Zeus and revived the project. The Roman architect, Decimus Cossutius was placed in charge, and he altered the design plan a bit. He rearranged the design plan, upgraded the material used to make the columns, and increased the height of each one. The project was halted, yet again when Antiochus died. The Temple was half finished at this point. 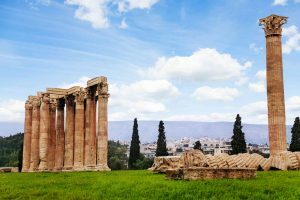 The Temple of Zeus was finally completed around 125 AD. A colossal statue of Zeus occupied its cella, keeping vigilant watch over the people of Athens. Want help booking an intriguing Greek Vacation? Please contact AESU by calling 800-638-7640 or fill out the contact form found on our website. And don’t forget to check out all of our great Travel Tips, especially the Travel Tips for Europe, before you head overseas. This entry was posted on Wednesday, March 8th, 2017	at 1:38 pm	. You can follow any responses to this entry through the RSS 2.0	feed. Both comments and pings are currently closed.